Our free range geese graze on the Herons Farm paddocks from four weeks old. The goose is a seasonal bird with the first egg being laid around Valentine’s Day and the laying period finishing in July. We collect day old goslings from a family run hatchery in Norfolk in two batches, the first in mid-April and the second batch four weeks later. We aim to get the first available goslings, which enables our geese to graze free range for the maximum possible time. The four-week old goslings are released into the paddocks from mid-May when the grass is at its best and will benefit the geese the most. After the spring flush, the grass begins to lose its value and we introduce wheat grown here on the farm into their diet. Unlike intensive producers which slaughter geese at 18 weeks old, Blackwells Free Range Geese are slaughtered at 26 to 30 weeks old when the geese are fully mature and full of flavour. 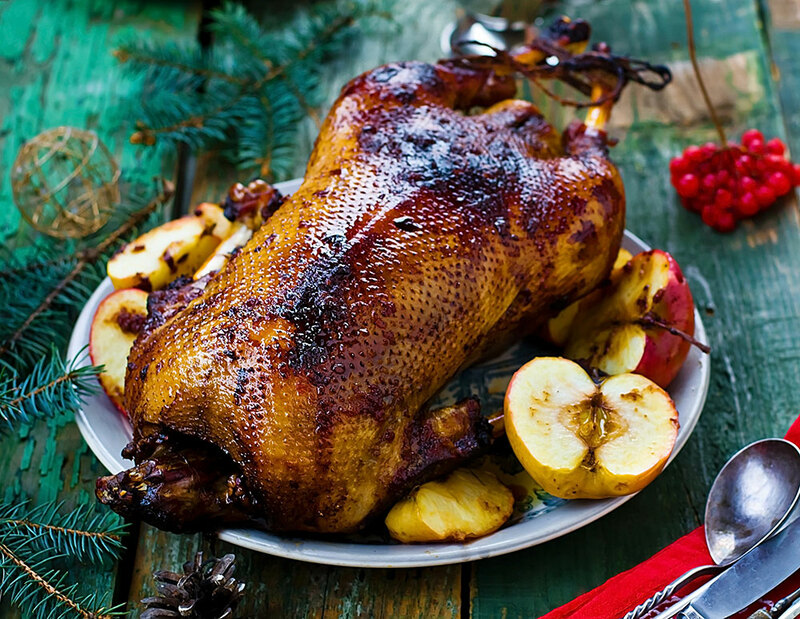 Goose is a flavoursome, high density meat which calls for smaller portions than other types of poultry and best of all, there is little to no waste from a goose – see our cooking tips below. Why should you buy a Blackwells Goose? Producing high quality, free range and ethically reared meat is at the heart of everything we do at Herons Farm. Geese do not lend themselves to intensive rearing. Intensively reared geese are slaughtered before the birds reach full maturity and many large producers rear geese indoors in controlled environments; their muscles do not fully mature and the birds will be floppy and wet in appearance. Blackwells Free Range Geese are reared to maturity with the benefit of a summer’s fresh grass, dry plucked and game hung for rich, dark and succulent meat that can be cooked to perfection with a crisp golden skin. Goose is a very economical bird with little or no waste. There is the added bonus of goose fat drained off during the cooking process which keeps well in refrigerator or freezer. Goose fat is invaluable for deliciously crisp roast potatoes and makes exceptionally light pastry. As a general rule allow approximately 1lb (454g) per person when purchasing a fresh oven ready bird. Remove the giblets and the body cavity fat. Store the giblets and the goose separately in the fridge. Frozen birds must be allowed to thaw thoroughly before cooking, follow instructions. Place the goose in a large, deep meat tin ideally with a trivet or rack, foil, salt and pepper and stuffing of your choice. Allow 15 minutes per 450g / l lb plus 20 minutes. 1. Make sure the oven and roasting tin will accommodate the bird! If it’s a tight fit, place the bird diagonally in the tin. 2. Use large width tin foil to wrap the roasting tin to avoid spillages. 3. Cover legs in fat and wrap in foil. Remove foil for the last 20 minutes, baste the breast with the fat and pour off the surplus. 4. Siphon off some fat from the roasting tin during cooking, ideally using a bulb baster, and use for potatoes and parsnips. 5. Rest for 30 minutes, then carve either from the breast or remove complete breasts and carve across the grain into slices. 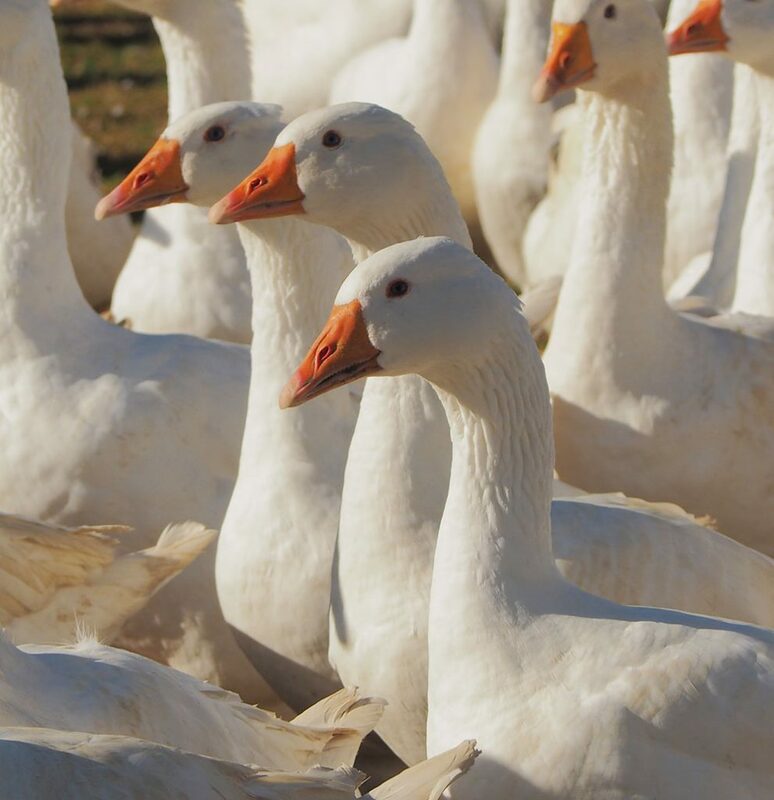 Fresh geese are available from Michaelmas in late September to December. Geese store well in the freezer for use at other times of the year with no adverse effect on the flavour. Thaw slowly for 24-48 hours.